Recording MIDI and audio will take you a long way when it comes to having media to play with in your session. However, what about those moments when you want to drag in your favorite drum sample? There are a lot of audio formats out there and out of all, only two are compatible with Pro Tools – WAV and AIFF. Pro Tools is not limited to working with just these two, however. Pro Tools can recognize and convert mostly all audio formats. What about video? Yes, Pro Tools can play video as well – you cannot create any video or do any real editing but you can add a video to your session. Throughout this article, we will take a look at formats and media import scenarios. As I already mentioned there are two formats that are native to Pro Tools – WAV and AIFF. WAV is short for waveform audio file format – catchy name, right? – and is a file format created by Microsoft and IBM as a standard for audio streaming on PCs. AIFF or audio interchange file format is a file format developed by Apple that is most commonly used in conjunction with Apple devices. Apart from these, there are many other file formats that Pro Tools can work with. You will not be able to add these to your session but you can convert to WAV or AIFF using Pro Tools. Among the formats Pro Tools can convert are MP3, BWF, SD I/II, MXF, AIFL, MWA, MOV, AAC, M4A, REX, ACID. It is important to note that out of all these there is only one video format – the only one supported – MOV. Whenever you are importing audio into Pro Tools you will need to do some file conversion in order to match the file’s parameter’s to the session’s. Otherwise, your file won’t play back correctly. Of course, if the file format is not native to Pro Tools conversion is also necessary. So, what is conversion? Shortly, it is the process of changing format, bit depth and sampling rate in order to match the session’s parameters. For example, if you are working on a 24 bit, 44.1 kHz session and you want to import a 16 bit, 44.1 kHz WAV, that file will need to go through the conversion in order to get a bunch of zeros and ones stuck onto it and magically turn into 24 bit audio. If the file was 32 bit then the conversion would chop off some binary information – the result? Loss of quality. Another example is when the audio you are trying to import has a different sample rate, in which case, sample rate conversion is necessary (denoted SRC in Pro Tools). The process of sample rate conversion happens either on its own or by your preference as you can choose the algorithm that Pro Tools uses to convert the sample rate. In the “Preferences” tab under “Processing”, there is a “Sample Rate Conversion Quality” drop down menu with a bunch of options: Low, Good, Better, Best, TweakHead. It’s hard to see why, but they did not name the best one “Best” as the best one is TweakHead – and the slowest. As we can see I selected a file that is MP3, 16 bits and has 44.1 kHz sample rate, thus it needs conversion. After clicking on “Convert” the file suddenly appears in the right-hand column and you get to choose whether you want to apply SRC or not (you might want your file to play back erroneously, who knows?) and to choose the algorithm and sample rate. In the case of my file, it does not need SRC so I can go ahead and click “Done”. After clicking “Done” you will be prompted to choose a storage place for the converted file and whether you want the file on a new track or in the clips list. You can also use the Import Audio command for batch imports – you just have to select more files at once. You can always import in a glimpse via a drag & drop operation when you do not need hands-on control on where files are stored, how are they going to be converted and other such parameters. Importing via drag & drop from your desktop or folders is as easy as it sounds: just drag & drop. If you prefer using the Workspace Browser, I am happy to tell you that it’s just as simple, only it is easier to drag & drop multiple files from the workspace browser. Because you cannot actually do anything to video files in Pro Tools the “Import Video” command is as basic as they get. Invoke the command from the “File” menu, under “Import”. You will be prompted to choose a video – remember it has to be MOV. Upon choosing one, you will be prompted to choose whether to also import the audio from the video and the time location of the video in the session. After that Pro Tools will tell you that your video engine must be enabled in order to work with video and will prompt you again for the place to store the audio file from the video if you chose to import it. That’s about it, folks! 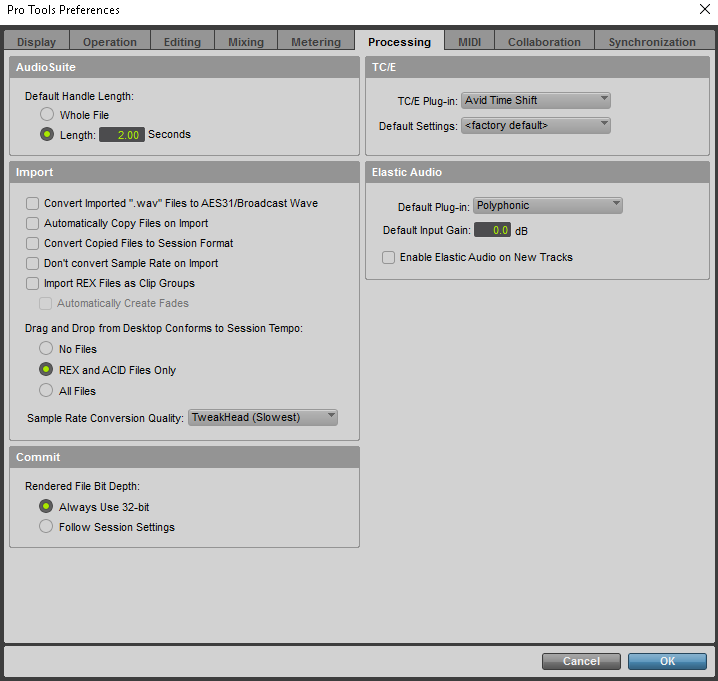 Pro Tools really offers you a plethora of options when it comes to importing – be sure to know them all so it easier for you to work with all sorts of media formats as this is a very powerful tool for all of us Pro Tools users out there.